For this week we once again came across some very interesting articles and headlines which correlate very well to end-times bible prophecy. Regarding the Seven year covenant of peace that bible prophecy says will be confirmed by the Antichrist, we read that the Trump Administration is drafting a new peace endeavor which will be more of a regional peace deal involving much of the Middle-East rather than a just the Israelis and Palestinians. This is significant in that the prophecy from Daniel says that this peace agreement will involve the 'many' which suggests far more than a bilateral agreement between two nations. US President Donald Trump’s administration will shortly unveil a formal proposal for Middle East peace that aims to enable a “comprehensive regional arrangement,” but that will not be imposed on the sides, and that will not feature a rigid timetable, Israel’s Channel 2 news reported on Sunday evening. Then there is the future One World governmental system, (New World Order), of the Antichrist. The articles and video below make no pretext as to what the global elites desire and want right now; That being global government. As one of the world's biggest conspiracy theories, the Illuminati is alleged to be a secretive global elite which runs world governments from behind the scenes and is planning to introduce a New World Order (NWO) to control the globe through one sinister organization. Prior to the establishment of the One World Global Government, the revival of the Roman Empire, or a facsimile of such, must first be established. (It is from this entity that world government will be put into place). Aside from the United Kingdom which is in the process of removing itself from the future United States of Europe Superstate, all other European nations seem ready to give up their sovereignty for the sake of this hungry monster. And there even seems to be a leader ready, willing and able to take over the head of this revived empire. Now that the German Chancellor, Angela Merkel, has run into political difficulties at home, the President of France, Emmanuel Macron, may become, unofficially, the leader of the European Union. During the coming Tribulation period, there will be an image of the Beast set up and according to bible prophecy will seemingly come to life to the point of speaking and relating to the masses individually. This was never before possible until now. Soon we will see the chilling creation of an artificial intelligent "God Robot" or more precisely a highly intelligent collective conscious super-computer that will be a billion times smarter than the smartest person with the ability to speak and interact with humanity. Certainly a prime fit for what prophecy calls the Image of the Beast. They say a picture says a thousand words and the picture below is no exception. The leaders of Persia, (Iran), Magog, (Russia), and Beth Togarmah, (Turkey), all holding hands in solidarity. 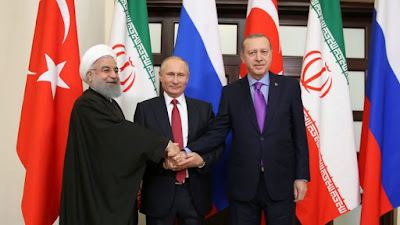 These are the exact three nations that the prophet Ezekiel says will form the basis of the Gog/Magog alliance of nations, (along with several other Middle-Eastern belligerents), who will attempt to invade Israel during the Last Days. The leaders of Russia, Turkey and Iran on Wednesday discussed ways to promote a peaceful settlement in Syria, including the return of refugees, humanitarian aid and prisoners’ exchange, while fractured Syrian opposition groups were meeting in Saudi Arabia in a bid to overcome their divisions and form a united front for Syrian peace talks in Geneva. As always, there is much happening in this world of ours that indicates we are fast approaching the final seven years of mans governorship of this world, (Jesus Christ will take over after that with the 1,000 year Millennial Kingdom). So keep watching and keep looking up for redemption draws ever closer. What is causing the mysterious 'booms' heard in 64 locations around the world this year? Teachers told NOT refer to pupils as 'girls or boys' because "it reminds them of their gender"